Welcome to Mercedes-Benz GLC Forum, is this your first visit? Click the "Create Account" button now to join. My Mercedes sales person tells me that the Garmin Map Pilot is and will not be available for GLC 2016. Is this correct? Right now its only available for the C-Class, CLA-Class, and CLS-Class. Certainly is available in Europe! It's shame that its not available in US. Why Mercedes do that? Is there any software update so US model can use Garmin Map Pilot? Mercedes are you reading this? I surprised that you read my post. Well here is the situation; I purchased brand new 2016 GLC 300 which does not have factory installed GPS. I tried to find ways to get GPS. I read and saw on YouTube several ways Mercedes can have GPS. I tried all and including talking to local Mercedes dealer. Last attempt was to get Garmin Map Pilot (Part # A2139062704 ) which I have in my hand. Problem is the car DOES NOT HAVE SD Slot. It has 2- USB slots. I have Navi button on my console but it's "FAKE" one. I do have "Audio 20" system. Even though you and AMAZON advertise that the said map works in 2016 GLC model it does not. So what do I believe? It will be miracle if you can help me before I return my SD card. Sorry just read your post again. The Audio 20 doesn't support the Garmin as there is no GPS antenna, you have to purchase a retrofit kit. Did you check your sticker to confirm yours doesn't have a pre-wiring? @BRPatel Found the kit for you on ebay. Mercedes-Benz GLC Forum is the premier Mercedes GLC community. We offer one of the largest collection of Mercedes-Benz GLC related news, gallery and technical articles. Share your favorite Mercedes-Benz GLC photos as well as engage in discussions with fellow Mercedes GLC owners on our message board. 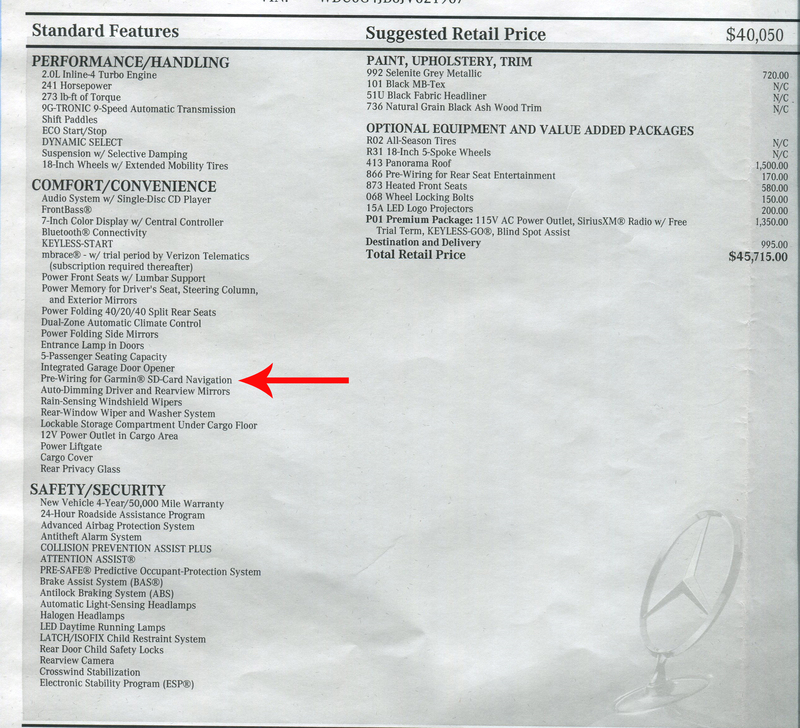 MercedesBenzGLC.com remains independent and is not affiliated with, sponsored by, or endorsed by Mercedes-Benz.